Includes company logo on table and priority seating. Please contact the office for bookings. Shale gas opportunities in the Northern Territory: reality or pipe-dream? The North American oil and gas industry was transformed from around 2005 as independent exploration and production companies perfected the extraction of gas, and later hydrocarbon liquids, from source rocks or “shales” through a combination of horizontal drilling and hydraulic fracturing. By late 2014 oil supply from US shale plays was sufficient to change the global oil supply-demand balance, oil prices and oil-linked LNG prices plummeted. To date, only Argentina and China have managed to emulate a fraction of the success of the US and Canadian shale gas producers; despite efforts across dozens of countries across the globe. Australia has largely seen disappointing technical results from unconventional exploration outside of Queensland’s CSG fields, however, the Beetaloo Basin in the Northern Territory has bucked this record. 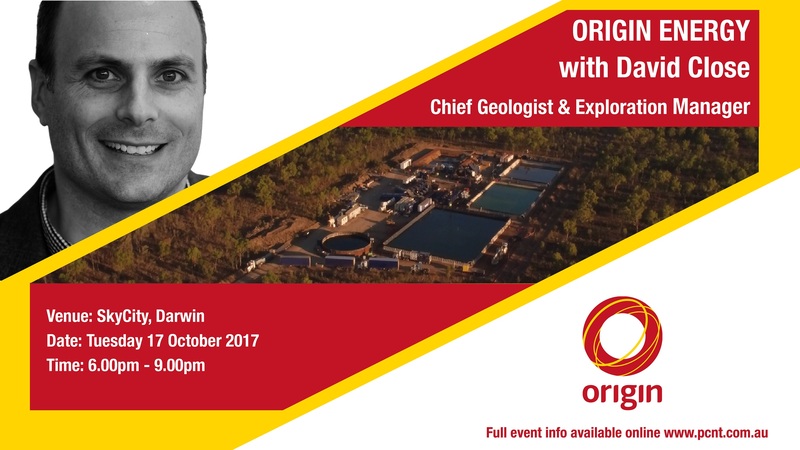 Origin is one of a number of Australian companies exploring and appraising shale plays in the Beetaloo and earlier this year announced a contingent resource of 6.6 trillion cubic feet. The Beetaloo offers a development opportunity potentially unequalled in Australia, however, there remain various technical and non-technical challenges to seeing the potential realised. Origin's exploration and production portfolio includes the Bowen, Surat and Cooper / Eromanga basins in Central Australia, the Otway and Bass basins in Southern Australia, as well as interests in the Browse and Perth Basin in Western Australia and the Bonaparte and Beetaloo Basin in the Northern Territory. Origin also have exploration projects located in New Zealand in the Taranaki and Canterbury basins, as well as in Vietnam. PLEASE NOTE: PCNT AGM will be held immediately prior to networking dinner. Doors will open for Industry dinner from 6.00pm.